Heat oven to 350°F. Place paper baking cup in each of 24 regular-size muffin cups. Make and bake cake mix as directed on box for cupcakes, using water, oil and whole eggs. Cool 10 minutes; remove from pans to cooling racks. Cool completely. With end of wooden spoon handle, make deep, 3/4-inchwide indentation in center of top of each cupcake, not quite to bottom. Spoon lemon curd into resealable food-storage plastic bag; seal bag. Cut 3/8-inch tip off one bottom corner of bag. Insert tip of bag into opening in each cupcake; squeeze bag to fill opening. Increase oven temperature to 450°F. In 1-quart saucepan, mix sugar, 1/4 cup water and the salt. Cook over medium heat, stirring just until sugar dissolves. Heat to boiling. Boil about 8 minutes, without stirring, to 238°F on candy thermometer; remove from heat. In medium bowl, beat egg whites and cream of tartar with electric mixer on high speed until soft peaks form. Pour hot sugar syrup in thin stream over egg whites, beating until stiff peaks form. Beat in vanilla. Spoon meringue into decorating bag fitted with open #6 tip. 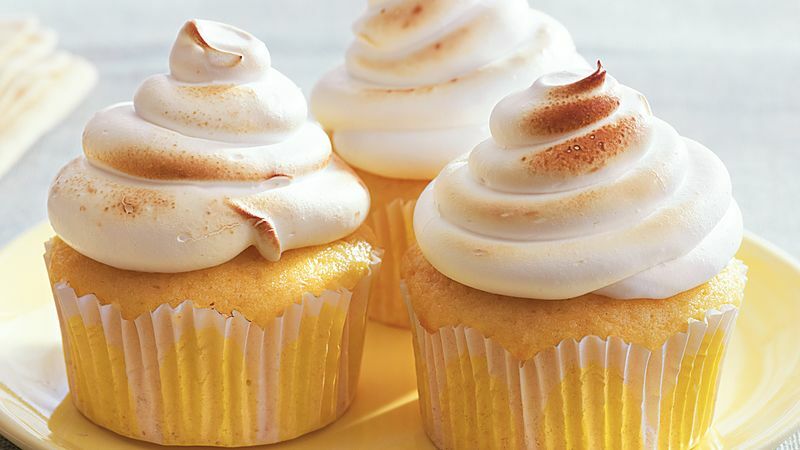 Pipe meringue onto cupcakes. Place cupcakes on cookie sheet. Bake 2 to 4 minutes or until lightly browned.